Islamabad, April 11: Pakistan's Foreign Minister Shah Mehmood Qureshi on Wednesday (local time) underlined that the only way for India and Pakistan to move forward is through talks. Qureshi said that Islamabad requires a "willing and constructive partner to tackle the myriad daunting challenges" that the region is facing. "A peaceful neighbourhood is an essential condition to build prosperous societies," The Dawn quoted Qureshi as saying while addressing a National Conference on Strategic Stability in South Asia here. Pakistan Foreign Minister Shah Mehmood Qureshi to Skip OIC Meet Due to Sushma Swaraj's Presence as 'Guest of Honour'. Amid the already strained tensions between India and Pakistan, Qureshi said that both the nations should work towards addressing the "underlying challenges" to strategic stability in the region. Citing the example of Kashmir issue, which has remained unresolved for over 70 years, Qureshi stressed that any conflict resolution plays a crucial role in ensuring a successful strategic stability arrangement in the region. 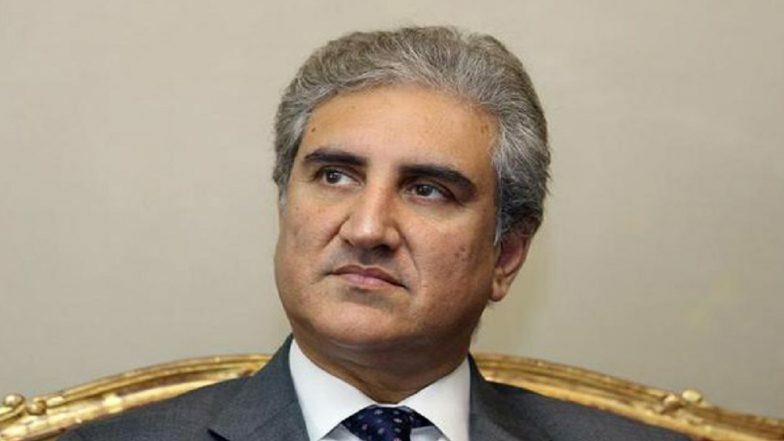 "It (Kashmir issue) lies at the heart of every crisis between Pakistan and India, including the events in February," Qureshi said while referring to the aerial dogfight between the two nations in the wake of the Pulwama attack. Tensions between India and Pakistan sparked following the February 14 Pulwama terror attack in Jammu and Kashmir. Forty CRPF personnel had lost their lives in the attack that was claimed responsibility by Pakistan-based Jaish-e-Mohammad (JeM) terror group. The incident provoked international condemnation and pressure on Pakistan, urging it to intensify its crackdown on terror groups operating from its soil.On February 26, India launched an air strike at a JeM training camp in Balakot in Pakistan in retaliation to the Pulwama attack. Pakistan Foreign Minister Shah Mahmood Qureshi Says International Media Will be Taken to IAF Raid Site in Balakot. The Balakot airstrike was followed by a dogfight between Indian and Pakistani air forces in which a Pakistani F-16 jet and an Indian fighter plane were shot down. Wing Commander Abhinandan Varthaman was captured by Pakistani authorities but was released on March 1 as a "peace of gesture", according to Pakistan Prime Minister Imran Khan. Meanwhile, Qureshi called on the need for a peaceful environment contributing to socio-economic development and welfare of the people in the region.